A smile is a curve that sets everything straight. And for your smile to be as beautiful as possible, you can always rely on Herbodanty, an ayurvedic tooth powder created by blending in some of the choicest herbs. Trust us, there couldn't be an easier way into the world of sparkling white teeth and healthy gums. 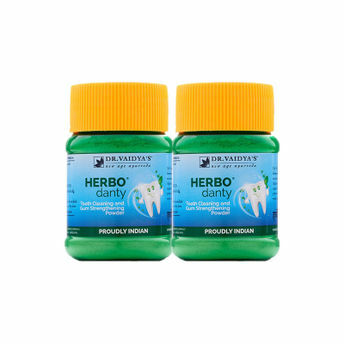 Dr. Vaidya's Herbodanty Powder combines the healing properties of 10 herbs to strengthen teeth and gums. This tooth powder is an Ayurvedic replacement to a toothpaste that is completely natural, fluoride free and sugar/ salt free. It prevents bleeding gums, tartar formation, yellowness and tooth decay.